Assistant manager Pat Rice praised the battling qualities shown by Arsenal against Borussia Dortmund and believes the team have turned the corner. Arsenal were denied victory in their Champions League Group F encounter at Signal Iduna Park as an exquisite volley from substitute Ivan Perisic secured a last-gasp 1-1 draw. It looked as if Robin van Persie had snatched Arsenal an unlikely victory in Germany after withstanding a barrage of attacks before the home side struck a late blow. With manager ArsÃ¨ne Wenger forced to watch from the stands due to a touchline ban, assistant Rice was the man charged with leading the side and he was proud of the team’s effort. ”We battled really hard and we knew it would be a hard, hard game,” he said. ”To be able to defend well is a high quality skill and that is something all of our players did this evening. I shouldn’t think many teams will come to Dortmund and beat them and we were very, very close to doing that. ”Don’t forget Dortmund are a really good side. There is no question about that. ”Would we have liked to have won the game? Of course we would. We were so close and so very, very near. ”But the same thing happened to us in terms of the goal as happened when we played arch rivals Tottenham and the boy (Danny) Rose hit an unbelievable shot from about 35 yards. Tonight’s hard-fought result followed the 1-0 defeat of Swansea at the weekend. Wenger has admitted he hoped for a win that would kick-start their season but, despite the late equaliser, Rice believes the draw can have the same effect. Asked whether Arsenal have turned the corner, he said: ”Very much so. It seemed, especially the game on Saturday, it was our start of the season. ”Because of the uncertainty as to who the players would be that leave us and whether they wouldn’t. Rice will return to his regular role alongside Wenger in Saturday’s Premier League match at Blackburn as the Frenchman’s ban only covers European games. The former defender admitted it was odd not having Wenger alongside him and the experience reinforced his decision not to get into management. ”It was extremely strange not having the manager next to me,” he said. ”Usually he is shouting in my ear: ‘why did he do that’ and ‘why didn’t he do that’. Uefa have their reasons why. Jurgen Klopp was the man in the opposite dugout and the Borussia Dortmund manager was delighted by his side’s showing. ”I am very satisfied with the performance of my team today,” he said. 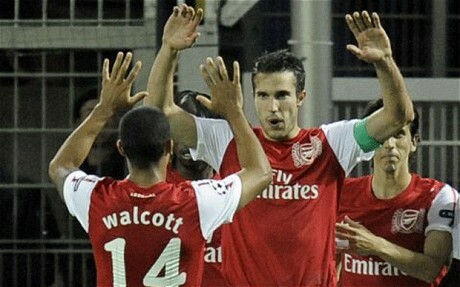 “Arsenal are a very offensive-playing team and we were able to hold them.